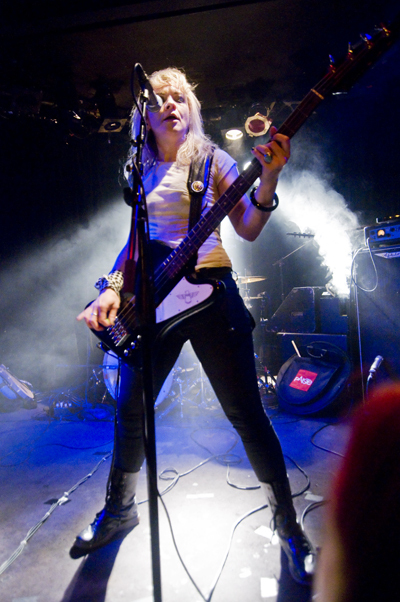 The Dollyrots perform new songs of the new album at The Viper Room. Last Thursday, The Dollyrots held an exclusive sneak peak listening party at The Viper Room where they performed new songs off their upcoming album. It also marked the debut of newest member and drummer Alicia Warrington. The special night started out with the Mayor of Sunset Strip, Rodney Bingenheimer, introducing the band as The Dollyrots hyped the packed crowd with the super contagious "Hyper." Their set consisted of all new songs except for "Brand New Key" and "Because I'm Awesome." And judging by their new material, The Dollyrots' new album is going to be OFF THE HOOK! Conjuring a coastal punk feel, The Dollyrots' songs have always been loaded with catchy hooks delivered over feel good sing-along choruses. That's one staple that you can always count on the Dollyrots to deliver - carefree and soaring melodies that balance lead singer Kelly Ogden's soft, squeaky clean vocals with Luis Cabezas' assault on guitar. What I did notice was a much more softer, alt-pop glow showcased in tunes like "Time" and "Satellite." We even saw Luis take the lead vocal duties on "Interaction" with Kelly singing backup. But don't fret, The Dollyrots we fell in love with can be heard in their very buzz, punky songs "Twist" and "Wanna Go." It felt like a much more mature Dollyrots this night in their sound and songwriting, a trend that follows their 2010 album A Little Messed Up, their last with Joan Jett's Blackheart Records before deciding to go and release their new album independently with the help of their fans via Kickstarter back in September. 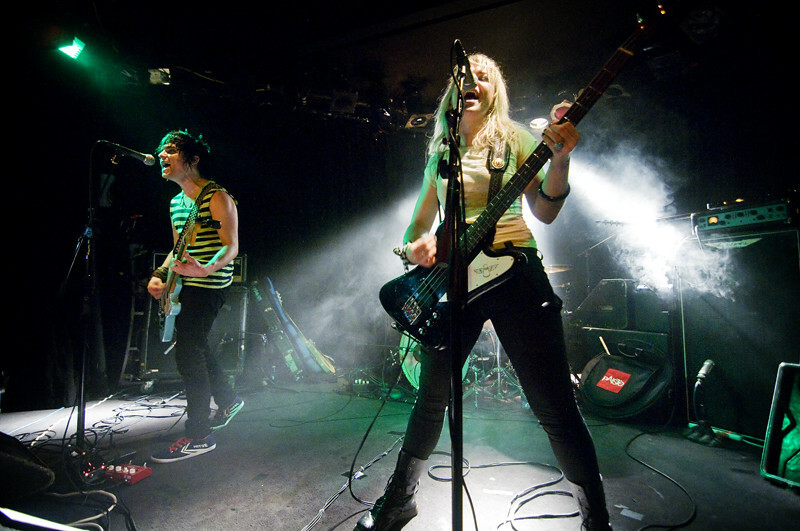 Now, The Dollyrots are set to release their fourth album LP with producer John Fields VERY SOON. If you missed them last week, The Dollyrots will be playing March 30th at The Madhaus in Long Beach. Be there! I may just make the drive myself and now that I know most of the words (thanks youtube), I can now sing along!! Queen Caveat performs at The Viper Room. Later in the night, Queen Caveat performed a rousing set with ABC News cameras filming the entire performance for an upcoming feature of the band in a 2-hour documentary titled "Sunset Boulevard" which is set to air in the spring this year on 20/20. 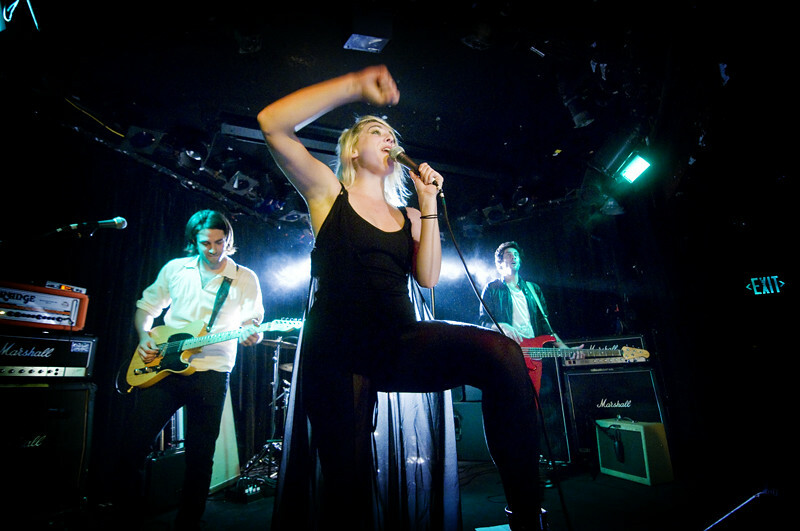 Known for their adrenalin-fueled live performances, Queen Caveat, let by front-woman Lauren Little grew a wide following after gaining rave reviews from their successful debut EP Emptor and performing to packed crowds at venues all over Los Angeles including The Roxy and The Viper Room. Earlier this month, they released their sophomore EP Slap on the Wrist which includes their snarling and bruising hit single "What Built Me." They generated a lot more buzz when they performed to pack venues at their first showcases at last year's SXSW and they return this week for a second time which are sure to be packed once again. And later this year, more fans across the nation will discover Queen Caveat as they embark on their nationwide tour this summer. Queen Caveat at The Viper Room.